This piece has finally been released on the HALO: FAITH page so I can post it here. The Grunt was easily my favorite painting on the whole project and maybe even my favorite painting in general recently. I loved painting the texture of the skin and how natural all of the design elements I considered fell together to create this guy. Doing my research I found that the Grunts in HALO are apparently the size of a gorilla (male gorillas can be as big as 5.6ft tall) so I started thinking about how freaky an albino gorilla might look and I wanted to really capture that in the Grunt's eyes - Pinkish red eyes with grey skin really creeps me out. I also thought making the Grunt's head more elongated would give it an unnatural, alien feeling as opposed to the squat, round head they have in the games. This choice reminded me of an octopus which has a similarly elongated skull and that then led to the idea of tentacle-like methane gas hoses covering his armor and the spines on his arms like you would see on a sea urchin or some other aquatic sea life. The clawed hands were simply the result of wanting to make this guy look like he could rip you apart and eat you... taking it as far away form the comical nature of the Grunts in the games as I possibly could. When working on the armor, I figured that Grunts are the cannon-fodder of the Covenant army so I thought their equipment wouldn't be maintained as well as the Elites, Jackals or Hunters and that's how the dirty, rusty look for that came about. A good design should always have a story to tell. It doesn't have to be obvious but it can mean the difference between a formulaic design and something truly unique and special (btw, I'm not claiming that my Grunt is either unique or special :-p). 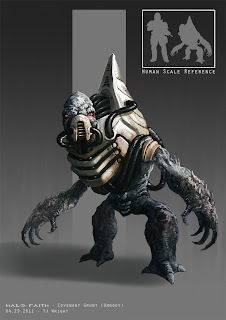 While I do rather enjoy the nature of the original grunts in their orange and crimson armour, I also rather like your rendition of these unfortunate unggoy, the breast-plate and awkward gait of him especially. 'Used Future' is a great element, especially here on the rank and file.